Gutter cleaning in Chanhassen like many Twin Cities towns is critical to your home because of the dense tree cover typical in much of the Metro area. When looking for a gutter cleaner for your Chanhassen home you want something more than someone simply digging debris out of your gutter system, you want someone that is qualified to report back to you potential issues so you can get them corrected ASAP. I will personally do every job, and my 10+ years in the residential construction industry gives me the ability to see issues and even suggest the correct fixes. Sometimes I will be able to handle simple repairs myself, other times it is time to call in a qualified gutter installer. Gutter cleaning in crucial to the health of your homes drainage system so that you do not have water pooling against foundation walls and rotting away your roof system. Your gutter system is designed to collect water from your roof and move it away from your home, if it is not doing that the water will look for ways to enter your home which always results in costly repairs. We recommend an annual cleaning for your home either at the end of the season in October/November, or first thing in the spring upon thawing. Usually if you are able to do either time of the year the rest of the summer your gutter system typically will be working properly unless you have another source of debris besides a tree dropping leaves. 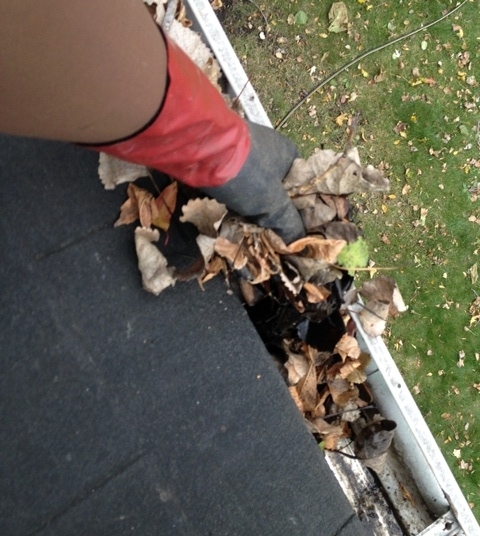 First we will hand clean each section of your gutter system bagging debris as we go to later be removed. Our goal is to for you not to realize we were there and there is little if any debris left on the ground around your home. Now that your gutters are cleaned out we need to make sure they are flowing properly, this is something that some of our competitors fail to do and we think is VERY important to making sure your gutters are working. We will flush each section of your gutters making sure the downspouts are not clogged, it is next to impossible to visually tell if they are clogged and running water down them is the only 100% way to be sure. After we are all done we will check the perimeter of your home and us a leaf blower to remove any debris that may have found its way onto your deck, sidewalk, or driveway. How about a quick exterior window clean? Since we are using water to flush your gutter systems odds are some water will find its way to your windows. We do offer a “quick clean” for our gutter customers that is not as detailed as our full cleans but I promise you will get a great value. Window Washing – No job is too small or too big, we adjust crew size to the particular job. I will personally beon each and every job so I know at the end of the day the quality of the job will meet your expectations and my desired level of service. Gutter Cleaning – Again we have the equipment to handle the highest gutters and I ensure your gutters will be flowing perfectly after we are done with your home.